What are two useful star patterns to know when stargazing toward the northern sky? 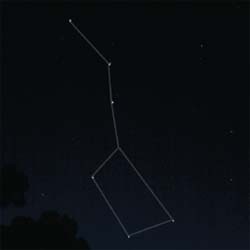 The Big Dipper, part of the constellation Ursa Major (the Great Bear), is a very useful asterism to know in the northern sky. It has a handle made of three stars (one of which is an apparent binary, composed of the stars Alcor and Mizar) and a trapezoid-shaped dipper of four stars. Its two outer dipper stars point toward the north celestial pole. On the other side of the pole, the constellation Casseiopeia (the Queen) is also relatively easy to spot. It looks like a large “W” made of five stars, which looked to the ancient Greeks like a throne where a queen would sit. The open side of the “W” faces the north celestial pole. The Big Dipper is part of the constellation Ursa Major (the Great Bear).